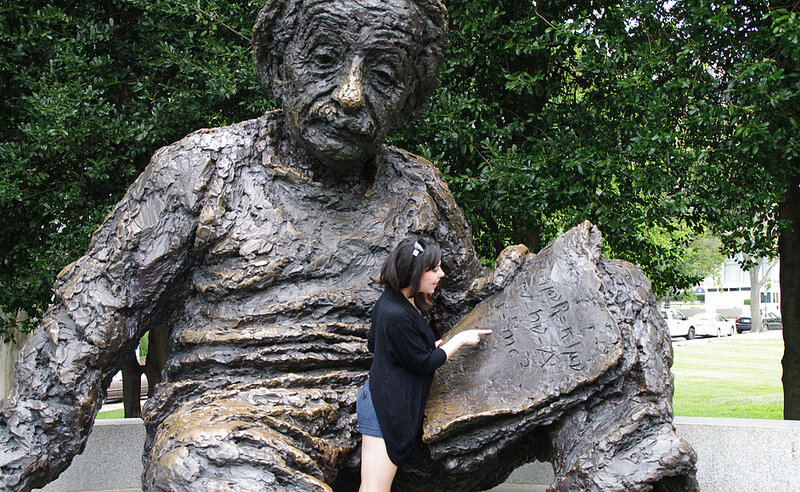 sheilahoneill	 August 30, 2015 North America Washington, D.C.
Our final stop in Washington was a visit to this unique bronze Einstein Memorial, before making the day long trip back to Toronto. We were on the road following a hearty breakfast from Whole Foods in the Foggy Bottom neighbourhood of the city, named for its vicinity to the water, which rises up in a fog over the in the mornings. The remainder of the day was rather uneventful, save for a stop to Dunkin’ Donuts, which is always a must in America! I was shocked though at how difficult it is to find a Dunkin’ in rural New York. It’s actually more likely to come across the Canadian counterpart, TIm Hortons. The time in the car was passed listening to podcasts by The Nerdist, accompanied by guests including Ed Helms and Will Arnett. As well as some psychologists (my choice) in the way of Philip Zimbardo and Steven Pinker.